We weren't sure what the message was. If Crete, Corfu, and Cypress are as easily confused by you as they have been by me, look for Crete on any map of Europe as the southern-most island of Greece. It is a 160 mile long, banana-shaped island with an east-west orientation and is roughly equidistant from Europe (mainland Greece), Africa and Asia (Turkey). 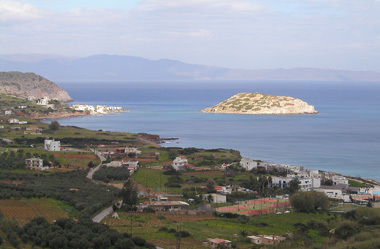 The Cretans promote themselves as being the vital center of the Mediterranean but they could also be viewed as being in the middle of nowhere. Their ‘in the middle’ position means that the Cretans were frequently invaded, plundered, and occupied from ancient times through WWII and surprisingly, have been a part of modern Greece less than 100 years. My quads burned in anticipation as I stood before the Iraklio museum’s topographic map of Crete—the mass of hills and mountains made the entire map look like the surface of waffle. A sizable chunk of the island was devoid of roads altogether because of the extreme roughness and steepness of the terrain. I quickly scanned for the interconnected river valleys that Map Man would wind us through and couldn’t find them. My out-of-condition mind and body groaned at the thought of endless hours of steep up-down-up-down riding. I begged Map Man to reveal his plan that would calm my quads. Fortunately, he did have a plan. It certainly wasn’t going to be the flat river riding of Germany but it would be doable riding with just 1 big “up” most days. The rain and wind finally subsided enough for us to leave our Cretan port town of Iraklio and head into the hills to really begin our much-delayed cyclotouring trip. Well, almost--we took the first good-weather day in Iraklio as a last bike maintenance day. 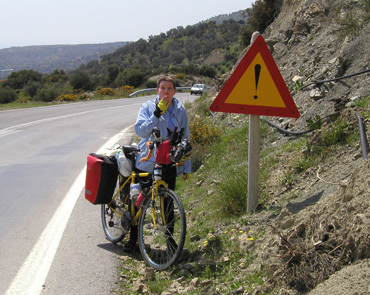 The weather had been so hostile since arriving in Greece that Bill hadn’t been able to complete the greasy bike maintenance work, especially the work which would get pounds of bulky bike parts out of the panniers and into use on the bikes. So the last chain finally got installed, a few more cables were replaced; the somewhat fragile cork handlebar tape gave up its hiding place inside our cook pot; and a few other, long awaited enhancements were made. No more using the bikes as luggage carts on and off the ferries: now it was time to compact our gear and ride, de-conditioned or not. We climbed the switch-backed roads up the sides of a series of steep gorges, much of it 5% grade with occasional flits of 10% grade. The orchards and patches of cultivated land finally gave way to craggy, crumbling rocks and low scrub. The day’s swirling winds had been picking up force as we approached the 3100’ summit and felt the additional fierce buffeting of the symbolically welcome ‘summit winds.’ As we looked up at the carcasses of old stone windmills marching along the steep ridge above us we were jolted by the sight of a series of 7000’ snow-capped mountains off across Lasithi Plateau. They were close enough to fill the frame in front of us and seeing them helped explain why we were adding more layers of clothing as we gawked at these imposing mountains. The motorcycle tourist guide Bill is using had recommended skipping this plateau in eastern Crete as it has little to offer except the fabled cave of Zeus’s birth and too many tourist shops. But I found the drama of the snow covered mountains with a perfectly level and lush green plateau at their feet enough reward for our effort. And the upside of being here in low season is that it is relatively easy to overlook the still-closed tourist shops and restaurants: they just become a variant in the characteristically haphazard look of Greek villages and towns. Coming to the plateau also enlivened a chapter I had recently read in a book about the Venetian Empire which discussed how the Venetians destroyed the plateau’s orchards in retaliation for disobedience by the indigenous population, which prompted a rereading while we spent the night on the plateau. Bill had read that in the past this lush plateau became a lake each spring from the melting mountain snow run-off but that it had been drained in modern times to capture the land for agriculture. The lake-bottom plateau has an out-of-place, flat look for such a mountainous region. The only significant flat land in the area had once been a lake. The plateau people in our lay-over village of Psihro were quite welcoming and we appreciated the one unlikely but modern little hotel. The old people sunning themselves in front of their homes or shops were quick to reply to our Greek “hello” and gave an approving nod and wave of a hard-work thickened hand. The man about our age trimming twigs off a pile of branches on his porch gave us a hearty welcome in English the first time we walked by. On our second pass we stopped to chat. He was quite pleased to tell us that he had been to both Portland and Seattle as a younger man aboard a ship taking NW wheat to Japan. He abruptly ended his maritime career when another of his ships sank while traveling from Houston to Japan, but he had fond memories of his brief contacts with the US. Psihro is one of those villages where the tourist shops and the old way of life are oddly juxtaposed. A few ceramics shops and restaurants are the main tourist haunts lining the narrow main road. 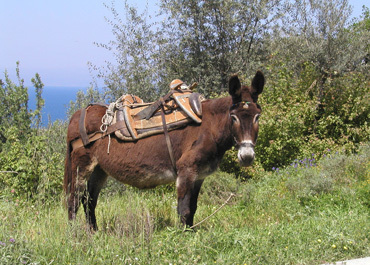 But in walking on the one paved through road and the village’s dirt roads we spotted donkeys parked in weedy front yards, chickens busily pecking at the ground and more than one squat old woman dressed in all black lumbering home with a goat or two. While cooking dinner and looking out our window between ceramic shops I spotted 2 women also in black from head to toe escorting a small herd of sheep and 2 hyperactive goats off of the lush lake bottom field and back into town. I haven’t a clue how happy these folks are with their lifestyle but they are certainly immersed in a graciously paced day. Young people are conspicuous in their absence in all of these villages and I suspect they have headed for the cities and only return to staff the tourists’ shops in high season, if that. Zeus’s cave at Psihro wasn’t a grand system of caverns like we have seen in Austria and the Czech Republic but an impressive single but branching cave of stalactites and stalagmites. There were 100’ column-like structures that had the look of massive clumps of jellies (aka jellyfish) with their mushroom-shaped caps and 20’ long, ribbon-like strands forming beneath them. A few of these giant columns had been knocked to the ground by rock falls and subsequently were becoming rounded and smoothed with the dripping water. 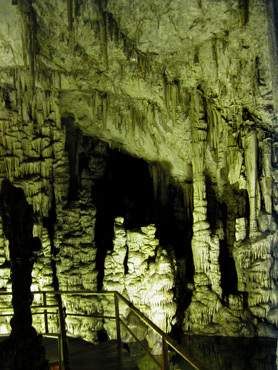 Some several foot-long stalactites forming on the cave ceiling revealed the faults through which the mineral-laden water seeped. And other parts of the ceiling seemed all but covered by stubby stalactites-to-be. My memory of the intriguing details of this type of cave fades all too quickly so I am always happy to see another one, Zeus’s birthplace or not. Bill and I both had noticed that we weren’t reveling in our Greek travels as we expected to and wondered if we had just seen too much and were getting jaded or that perhaps Greece wasn’t ‘our kind of place’ any more. But our enthusiasm for Greece and travel skyrocketed after a little over a month in Europe when we finally got to do what we came to do and that was to tour by bike. Like today, our third touring day of the season when we climbed back up to the rim of the 3000’ high basin we had spent the night in and prepared for our long, slow descent back to the sea. I could now identify the shift in perspective that happens when we tour in the countryside. Gone is the MTV-paced sensory barrage and numbing of urban life and concerns. Back comes the slow-motion experience of our bodies and our environment—one event at a time. We enjoyed the pulsing sensations and efforting in our bodies from the 600’ climb to the rim—enough challenge to both build strength and confidence. I savored the cozy sensations of putting on favorite warm clothes to shield me from the soon-to-come chilling descent and welcomed the warmth of the sun on my back between passing clouds. Nibbling on our roadside snack before descending allowed us to more fully take in the details of the harsh rocky surfaces and colors of the next hill. A little way down the mountain we stopped to be mesmerized by a large bird of prey soaring up over a 1000’ on the thermal drafts with nary a flap of his wings. Later we slowed to let a startled shaggy goat make his escape off the road and jealously watched as he deftly landed on all fours onto a tilted rock slab—one that we would have unceremoniously skidded off of for lack of traction. And we chuckled at the other goats that seemed to be posing for a photo: one standing on a park bench and the other calmly munching grass at a phone booth like he was expecting a call. The just-beginning-to-flower fruit trees reminded me of the 3” high wild purple iris we had seen earlier in the day. And at times when the sound of the wind quieted I could hear birds and clanking goat bells in the distance. These are the moments savored—when images and sensations so fully fill the movie screen of our minds that nothing else matters in that moment—for us that is the joy of touring. Now, that’s not to say every moment is idyllic of course. There are those stretches of road with too many cars or trucks, days with too much rain or wind, unpleasant whiffs of strong agricultural chemicals in the air, the mild rashes from the residual laundry products on one hotel’s linens, and that unfortunate morning when Bill sprinkled laundry detergent instead of powdered milk onto his cereal. But those experiences quickly fade into the background when the sweet moments fill our heads. Laundry detergent on breakfast cereal hasn’t been our only challenge, as the riding for the first touring week of the season has also stretched us. Bill has kept the days short, around 25 miles most days, to make up for the 2,000-3000’ daily gain we were accumulating from hill climbing. Our average speed is only about 6 miles an hour—just a little better than half our average speed under more usual riding conditions. Today was our 5th day of riding on Crete and it was the most intense with 2300’ gain in the first 23 kilometers of the day. That is a tidy 1000’/10 kilometers and we were remembering that last year in Turkey we thought 1000’/10 MILES was a hard day. Today was getting too close to being double that with a gain of 1000’/6.2 miles. Fortunately that was almost all of the climbing for the day with most of the remaining miles being spent getting back down to sea level for the night’s lodging. The ‘inclinometer’ is my new toy this year and it is entertaining me while climbing. I always wondered why a gizmo like a carpenter’s level couldn’t be used to reveal grade and indeed that is what my ‘inclinometer’ does. But unfortunately the poor darling maxes out at 20 percent and the bubble was banging its head against the wall yesterday on a very steep road. The good news is that we were going downhill so the 15 and 20 percent grades were challenging our hands and arms instead of our cardio-vascular systems and legs. The other road we took up out of the beautiful seaside town of Mohlos (population: 80) the next morning was steep but not as steep. The gauge’s bubble only briefly jammed itself against the 20 percent line and spent more time in the 5 and 10 percent range than the day before. Even with our few days of riding so far the grade gauge has been fascinating. We see grade posted on roads less than once a month but know that we traverse noteworthy grades much more often than that (like on these last 2 days). The gauge also gives us a way to ‘reality test’ as perception of grade can be very flawed. Like after pedaling up a short 15 percent pitch and Bill said “It’s leveling out”--that only meant the grade had settled down to 8-10 percent. Or other times like today when we would swear that we are going down hill from the look of the road ahead and yet we are still in one of our lowest gears—the gauge resolves the confusion and says we are indeed climbing (our altimeter concurred, though it is slower to register changes). The grade-gauge also has helped to make sense of the effect of wind on climbing. Yesterday was a very windy day, so much so that we walked across a bridge over a ravine rather than pedal. (Bill might have managed, but at 35 pounds less and with my longer legs giving me a higher center of gravity I was being mercilessly whipped around by the wind.) At one point we were climbing a 10 percent grade with a fierce tail wind directly behind us and we could feel with our legs and see on our speedometers that our speed increased almost 25 percent. And then today on another 10 percent grade we turned into a straight-on head wind and watched our speed drop more than 25 percent. Without the gauge we wouldn’t have known that those experiences were both on 10 percent grades. Oh yes, and then there is the other reality testing with our inclinometer: the accuracy of posted grade signs. One Cretan road posted was at 10 percent, which was usually the steepest part of the road but didn’t acknowledge those nasty intervals of 15 percent grade. And on another road the string of 10 percent grade signs appeared miles after the real 10 percent grades and were instead posted on 5 percent grade roads. Descending out of the hills to find quiet seaside Cretan villages. Bill unwittingly set the bar high our first week of touring by ending a second day at another splendid seaside hideaway. Kato Zakros is a beautiful quiet cove at the base of a dramatic, steep ravine and is also the site of one of the 4 Minoan palaces on the island. Like Mohlos, Kato Zakros is a non-touristy, tourist village. They both have small hotels of 6 or so rooms; shaded, casual, outdoor restaurants on the water’s edge; and beautiful natural settings—the kind of places you can imagine people planting themselves for months to write their memoir’s. And importantly, they both lack the large hotels that bring in huge crowds typical of package tourism and the rows of inevitable carnival-like shops that accompany them. Had the weather been enough warmer to invite lounging about, we might have stayed more than a night at both villages. But the lack of activities to keep us warm from moving about prodded us back onto our bikes and back on the road—the cool air indoors and out is one of the drawbacks of being an off-season tourist. “And on the 7th day…” we should have rested. Our first week of loaded touring was racking up the elevation gain despite the low daily mileage of about 25 miles. Last year it appeared that 15,000’ gain when partially loaded (as we are now without our camping gear) is about our limit and we reached that after day 6 this year. We felt OK and since day 7 was a return trip from the eastern tip of the island to our previous hotel at Sitia we knew there wouldn’t be any surprises. But we were wrong: the surprise was that I had reached my limit. Maybe I would have been OK if we hadn’t had to climb up 500’ with recurring 10 and 15 percent grades a couple of blocks after leaving our hotel’s doorstep in the morning. That steep grade up out of the sea level end of the ravine went well but we were only about a fourth of the way to our destination of Sitia before I knew I was on overload. My legs had lost their spring and they now persistently though mildly ached whether I was pedaling or not. We try hard to listen to our bodies and make adjustments sooner rather than later when they talk to us, hoping that if we respond when they whisper that they won’t ever have to shout. We slowed the pace even more and dragged me to our destination. It wasn’t a severe enough problem to hitch a ride on a bus or truck but it was enough to change Map Man’s plans and make tomorrow an overdue rest day. Despite being unrelentingly mountainous, Crete is the green-grocer for Greece. Even our first hour of riding out of Iraklio had made it easy to believe that this is where most of the country’s produce is grown. 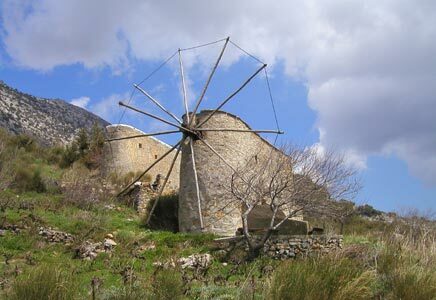 Unlike like the prickly-dry look of Mykonos and Santorini and much of mainland Greece, Crete is green. Now, we’re not talking lush, tropical green or grand forests mind you, just relatively more green. The eager farmers encroach right up to the very edge of the gray, crumbly rock surfaces and faces of the mountains with their orchards and fields. The trees and vines within a plot are in precise columns and rows and yet the individual plots are at odd angles to each other reflecting the always changing contours of the land. Flat land is all but nonexistent on Crete, so even the small clusters of hazy, plastic-covered green houses are stair-stepped on the slopes. And because rugged terrain is only partially tamed, fields of cereals are uncommon. Some regions are planted with only olive trees for miles and miles. The margin of these dense olive tree ‘forests’ can be discerned by the subtle but distinctive shift in green: the silvery underside of the slender olive leaves create a characteristic gray tone to the mass of green. In other areas a clover with a trumpet-shaped, brilliant yellow blossom grows under the olive trees creating a tremendous splash of color on the hillsides. We have been stunned by the sight of any undergrowth in olive groves as elsewhere in Greece and in Italy and Croatia the dry, tilled ground around the olive trees is usually bare. And it’s probably only a spring time phenomena, but we see some of this greenery on the move on the roads. Beat-up old mini-pick-up trucks and 3-wheeled rigs seemingly powered by lawn mower engines will rumble past us piled high with clover or olive branches and we’ll see olive branches strapped to car tops and being dragged home by elderly people on foot. This is pruning time for the olive trees and the pruning's are being burned on the roadside (or sometimes on the road) and being hauled off. I am guessing that the pruning's we seen ‘on the move’ are cherished booty for some lucky goats. This cool spring weather must also be the time for choice greens pickings as daily we see women and occasionally men along the roadside harvesting the next meal’s greens with a long, dull knife. Sometimes it’s just a handful, other times an arm load and sometimes the greens are left to wilt awhile on a rock wall. I would love to get a quick course from one of these folks on what we could be supplementing our meals with but fear that the competition for the good stuff might not be welcome. And I can’t help but assume this roadside harvesting explains the lack of green veggies in the markets—who needs them when the greens are literally free for the picking. But the Cretans don’t come by this ‘green’ easily as we see the somewhat flexible, hefty black plastic irrigation pipes snaking along side and underneath the road surface everywhere we go. Narrow black hoses may be strung through the olive tree branches whereas the 4” diameter pipes are haphazardly looped on the road shoulder and banks, draped across any trees, rocks or chunks of garbage along the way. And the growers aren’t shy about chipping out a channel across the roadway for their pipes. A common but colorful wild flower. Wildflowers are flourishing and their numbers seemed to have doubled overnight with the rising air temperature. Yellow is the dominant color and yellow clover with its trumpet-shaped flower is certainly the most abundant bloom. But there are also dandelions, something akin to Scotch broom, and an assortment of smaller yellow blossoms, some on plants barely a 1/2 inch high. In the un-irrigated areas there is a 2’ high stalky plant rising boldly above the rocky terrain with narrow yellow blooms bursting out on a section of the stalk. 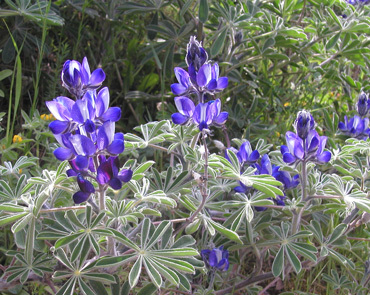 The purple and blue flowers are a distant second as the most prevalent color with trumpet-shaped blooms on sturdy, stalky plants as well as a more delicate, purple-pink, iris-like flower here and there and robust sage bushes with delicate lavender flowers. And occasionally we come across patches of white or yellow pedaled daisies confidently swaying in the wind. Tiny, intense pink blooms that only dot a portion of their heather-like green mounds at any one time and wild-rose-like pink blossoms growing on a plant with a more herb-like leaf are the predominant pink flowers we see. And occasionally we spot the divas of our wildflower world: the brilliant red poppies. They are few in number here but are always the show-stopper wherever they make an appearance. Seeing them is like seeing an old friend as we know that red poppies will be dotting our route for the next several months and in as many countries. 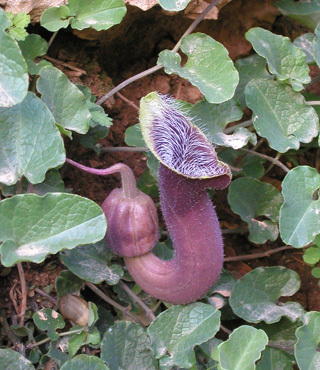 But it was on a short gorge walk at Kato Zakros that we spotted the strangest flower: an insect-trapping, U-shaped purplish flower growing close to the ground. At a little over 2” long the blossom is massive compared to the small, delicate leaves and its supporting vine. Later a German tourist rattled off the botanical name too fast for me to take it in but he added that the species was unique to Crete. Another pair of German tourists that Bill spoke with in German was quick to inform us that it wouldn’t be long until much of Crete turned brown from the summer heat. No doubt the abundant and brilliant clover and the assortment of wildflowers would quickly wither with only the irrigated areas retaining their green. Though I love the lush coolness of forests and trees, these more barren lands do make for more interesting peering at the geologic formations. Unlike many of its rugged Mediterranean neighbors, Crete has got enough top soil to be agriculturally significant but it still has a lot of exposed rock to keep us guessing about its history. We learned a new geological term on Santorini: phyllite, which was one of the rare, non-volcanic layers to be found there. And it turns out that there are enough phyllite-looking rock layers on Crete to anchor that word into our daily vocabulary. As we understand it, phyllites are rock formations made up of thousands of thin layers of slate-like rock that often have become undulating or wavy and may have the sheen of mica. Phyllites are fissile (split easily along close parallel planes) and are usually red, green or gray. Cross-sections that we have seen almost look like wood grain. Some of the Cretan phyllite layers that have gotten us off our bikes for a closer look are jumbles of heathery jade greens and heathery lavenders. These layers will sometimes be folded back on themselves in a section only a foot long or may be twisted so areas are fraying and fracturing off the sheer wall. We have seen these stunning and colorful phyllite layers inland on road cuts and on steep coastal cliffs. They have quickly become one of our favorite geologic sightings on Crete. Rarely did the scenery look back at us. When we were riding to the eastern tip of Crete we traversed a long section of deep purply-red earth and rocks. The start-stop of the layer was quite distinct and the red tones showed through on dirt roads, tilled fields and rock exposed by roads cut through small hills. There also have been fascinating ancient mudstone layers that cause us to pause and poke at the earth. Some of these mud-like layers have eroded in startling ways: almost rock-hard crusts creating curious, room-sized hollows; undercutting leaving behind threatening overhanging ledges; perplexing, hard-mud vertical plates formed from an unimaginable erosion process; and odd, nodule-like rocks or clumps in otherwise fine-grained mudstone. And then there are the very familiar gray-white craggy and mound-shaped rocks that we have seen in Croatia and other Mediterranean countries. But this time we realized that we were playing kind of a “Where’s Waldo?” picture game as a more concentrated look at some of the mound-like rocks in the distance revealed that they were actually perfectly camouflaged sheep. Doors: Windows into a Culture? Over a year ago I fantasized about someone filling a coffee table book with pictures of the delightfully decorative doors and doorways of Prague. Many of the of Prague’s large old town buildings have doors that are finely crafted in stone, wood or metal and range from grand to fanciful. The doors of the old Cretan villages we are visiting tell another story: not a story about an artistic rampage as in Prague but a story of ‘just enough’ as these doors are only about function. There are the rusted-in-place steel doors that have the deep, rich tones of fine woods; the rust-spotted corrugated metal doors; the doors made of half inch thick metal rope welded into a diamond grid pattern; and then the more welcoming, once-painted narrow metal doors that are almost half covered with glass panes. There was a string of old store fronts in one village of the Lasithi Plateau that looked like all the owners bought doors off the same ship when it arrived on the island decades ago. These are sets of a half dozen narrow doors that would allow most of the shop front to be opened at once. They too were almost half covered with glass panes. One set of these doors still sported some peeling blue paint though most sets had long ago shed the last of their paint curls. Some of these doors were also missing all of their glass and now only served as a symbolic boundary for the junk stashed behind them. Many old wooden slat doors looked like it had been years since a protective coating had quenched the thirsty wood and that one day the whole door would just slough-off its hinges. I can imagine that these village doors reflect an attitude about life up in these mountains: a life of scarcity, a life in the harsh winds and temperature extremes that the seasons dish-out, a life of just getting by. Neither these doors nor the homes and shops that they are attached to gleam with the pride in ownership that is so evident in northern Europe. The old, once-stuccoed, stone houses and the walls and possessions around them are just about function. There doesn’t seem to be an elaborate story or belief system about the sense of self worth of the owner reflected in their outward appearance. I can imagine some old Cretan saying like “If there is still something linking the hinges and the latch, then the door is good enough.” None of this fretting about warping, rusting, peeling, rotting, leaking or doing maintenance work. The pragmatic side of the Cretan’s is also revealed in the traditional engagement gift from the groom to the bride: about a foot long silver dagger for the sweet young thing to use in fending-off potential suitors. The sheathed dagger was kept handy diagonally across the young woman’s waist. The same folk museum that modeled the dagger did describe and display traditional Cretan handcrafts that were a repository of pride and skill that we don’t see flashed on the exteriors of the homesteads. Or maybe it’s just Greece. We weren’t at all surprised to hear on the news the other night that Greece had been severely reprimanded by the Olympic committee for being behind in their preparations for the 2004 games. We have been worried for them since first seeing their progress in early 2002. Then there are those other little things that remind us that we are in a different part of the world: the pervasive smell of cigarette smoke in museums from the staff smoking in the doorways; the museum guard clipping his finger nails onto the exhibit hall floor; the other guard popping his chewing gum bubbles in rhythm with this walk; and swerving to avoid the leaping flames and black smoke from the farmer’s slash burning on the edge of the pavement, then realizing he has fortified his bonfire with a tire. Those are the minor annoyances, but the real shocker was reading about the shepherd’s tradition of tying a dog to a stake to guard the flock. The dog is visited once a week to be minimally fed and the dog spends his entire life staked to that one spot. I wouldn’t believe it true but the story helped explain the look of more than one terribly thin, incessantly barking dog staked out on Santorini business property. As we biked into more rural Crete the sight and sound of these staked dogs became a daily experience, usually nowhere near any sheep. It is hard to imagine that these dogs tied down by 5-6’ long ropes do anything to repel 2 or 4-legged poachers of sheep or olives. These unloved, underfeed dogs seem to live miserable lives on a tiny patch of land with only a rusty barrel for shelter from the summer sun and the chilling, rain soaked winter winds. It was heart-wrenching to see the poor puppy that trembled as we walked by while bravely barking. And we had to wonder about the 2 dogs staked on the pavement’s edge opposite each other with the lengths of their ropes just barely allowing us to pass between them and stay out of biting range. For those of us who have shared our homes and hearts with pampered and indulged dogs it is painful to see these isolated and seemingly purposeless sentinels out on the roads. We have completed our tour of eastern Crete and are now heading west for more steep hills to climb and rugged scenery to admire. The weather has warmed a bit and…..but wait, I wrote that 3 days ago when I thought this email would go out. Now it is pouring down rain and we are spending our 3rd night in hotel rooms without heat. We have stopped washing out clothes because we know that they will not dry we and are instead slowly adding to our list of tricks for staying warm in damp rooms in the mid-50 degree range. Our latest discovery is using the mid-cord transformer on the laptop’s power cord to warm our hands or tuck between long john layers for a little boost in warmth. (It just doesn’t work well for nose warming though.) We were wrong about leaving the rains behind and we have also been wrong about leaving the winds behind too. The winds haven’t given up their ability to lash out with a steady 25 mph blow and gusts up to 40 or 50 mph, seemingly out of the blue. We are told that this is unusual weather for April but we are beginning to wonder….